The camphor laurel is an invasive weed here in Australia, though in some urban areas such as Graceville and Sherwood in Brisbane they are considered to be of historical significance. In its native lands of Asia, some larger specimens of this tree are considered monuments and are very much loved by the people who live around them. In Japan, Kamou no Ohkusu is a very large and old (possibly over 1,500 years old!) camphor tree which may have been the basis for the wonderful Camphor in the movie Totoro by the legend Hayao Miyazaki. In the movie, the magical creature Totoro lives in the hollow of the giant Camphor that resides near a temple. Kamou no Ohkusu is so large, it has an inner hollow area in its trunk that’s the size of a nice sized room, and not too long ago local school children would play in the hollow. Recently, the hollow has been closed off as it became a place for homeless people to sleep. Camphor Laurels are found all over Asia, but overall, like Kamou no Ohkusu, the largest specimens may exist in Japan, especially those on ancient temple grounds. Camphor, which is of course derived from the Camphor Laurel, has been used for centuries as a medicine, used in incense, and as a food additive. People used to make camphor by distilling the bark of the Camphor Laurel. Today however, camphor is chemically manufactured from turpentine oil. It’s the main ingredient in Vick’s Vapor Rub that gives it its smell and healing qualities when inhaled. Impressive as all that may be, the truth about the Camphor Laurel in Australia isn’t as fun. It’s been here in Australia for a long time, since before 1900. It displaces native large trees and multiplies easily by enticing animals to eat its fruit and spreading its seeds. It’s not just a problem here in Australia, but also in non-native tropical and sub-tropical regions all around the world. In the United States for example, the camphor is pushing out native and scarce trees such as the Florida jujube, or Ziziphus celatus. It can not only find a happy home in native lands, but also in disturbed sites as well. We recommend removing trees identified as camphor laurels in Brisbane if they aren’t of significance. If you’re unsure about the identity of a tree on your property and think it might be Camphor Laurel, simply remove a leaf or a piece of bark from the tree and smell it. If it smells strongly like medicine, it’s probably a Camphor tree. Large and evergreen, Camphor trees can reach heights of 30 or more metres. The growth is open and spreading. The branches grow in a gnarled form, making camphor tree’s structure actually very appealing. The trunk structure of camphor trees is fairly stout, single, and simple. In older specimens, the root flare is wide and quite impressive. The bark is cracked vertically and brown or light tan to grey in color. The flowers are very small and white, and are borne on panicles near the ends of the branches. Flies are highly attracted to the flowers as they have a very distinct smell about them. Many people would find the smell unpleasant. Camphor laurels will shoot from damaged roots. When removed they need to either ground out or poisoned by an arborist to ensure they don’t coppice. Their root system is dense and shallow which makes it hard for other trees to grow around them. The roots destabilize creek banks in riparian zones, adding to the damage this environmental weed causes. The Camphor Laurel is evergreen. The leaves are simple, thick, medium to dark green and shiny. They are alternate on each stem and about 10 cm long and 5 cm wide. The fruit is a berry, about 8mm in diameter. They start green and ripen to black. Each fruit contains one seed which easily passes through the guts of birds and animals. Easily grown from seed, proven by its spread in areas where it’s not native, the seed may need to be scarified as it would be in the guts of animals that eat the fruit. Camphor Laurel prefers areas that receive a lot of rainfall, but specimens have been documented to be thriving in drier areas. Camphor trees enjoy a wide range of soils. Young trees grow slowly in shade or densely planted areas, but as soon as they receive some sunlight, young trees can grow very fast, taking over a space fairly quickly. Camphors develop groves and out-compete native trees with their massive vascular root systems, and shade the ground below them densely inhibiting strong under-growth, effectively choking off all other competing plant species around it. They enjoy areas that are shared with native eucalids, but of course can’t feed the native wildlife such as Koala. Overgrazed land encourages camphor germination. 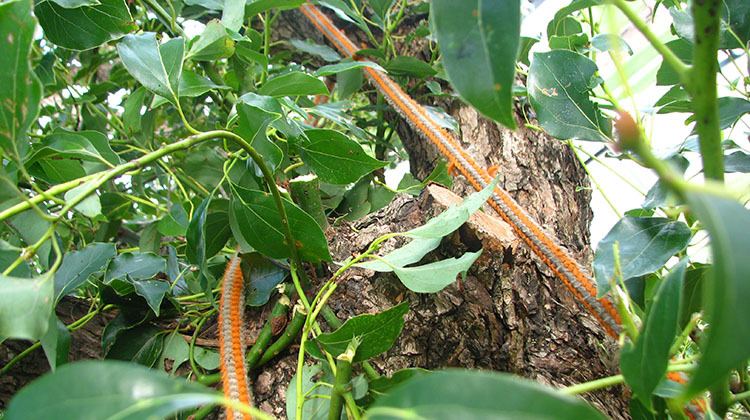 Landowners are highly encouraged to control and eradicate Camphor Laurels if they have them. 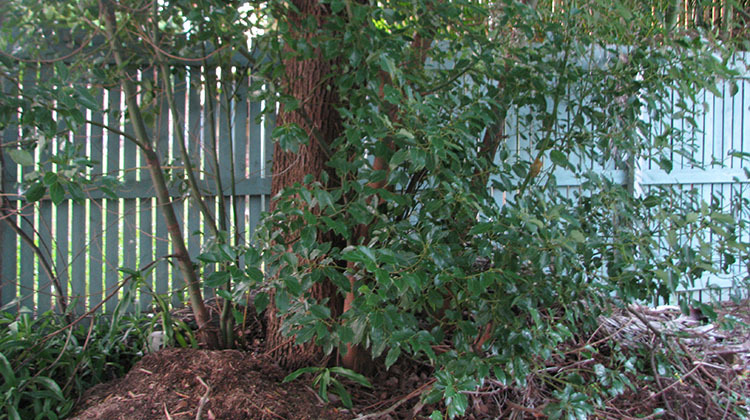 Manually removing trees appropriately is generally the better method of removing Camphor Laurels. Mechanical removal with heavy equipment may be necessary for larger trees. After trees are removed, any remaining stump can be treated with chemicals to kill the rest of the tree’s remains. Contact us for further help removing Camphor Laurels.